so yes, i’m rubbish at keeping anything up. which is why the next few months are going to be a challenge for me. i know me and my other half have been planning for an accident, but the accident hasn’t happened yet, so to speak. 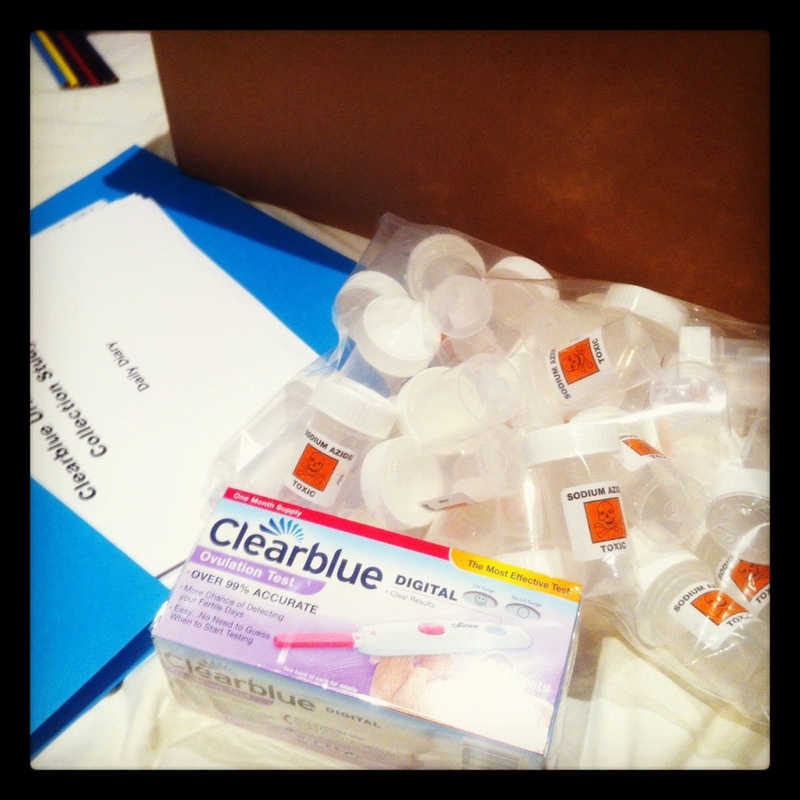 so i decided to take things up a notch and applied to be part of a clinical study run by clearblue, testing their ovulation kits. i got through and am now a registered volunteer, and waiting for Day One to come around. the challenging part is going to be getting into a routine for this. for the study, i have to pee in a pot every day, label it correctly, seal it, bag it up and store it, and every day i have to fill in two event diaries. on specific days i have to pee on ovulation sticks and hope for a smiley face. then every fourteen days i have to bag all of these things up, and get it all down to the post office to send it to the lab. and i have to do this for three months. it seemed like a good idea at the time: i thought i could do this easily. but then the box came and it’s a pretty hefty box and the reality has set in that i’m going to have to do this every day for the next three months. so. i guess this is the next thing on my To Do List. it wasn’t my plan to start up this then not write to it for days to weeks to months. it’s been a long time since the last post. and it’s been two months since i set myself my first public To Do list and gave myself a month to work on it. i actually managed one-and-a-half out of three of the things. the first thing, to make something, i started. i’m making a pendant for my mother-in-law out of silver PMC clay and embedding a black diamond my other half bought into it. except, i haven’t had the time to finish the piece. and i think i’ve made it too thick to be fired using my torch, so i’ve spent a month trying to decide whether i’m going to give firing it with the torch a go, or if i’m to send it off to have it done professionally in a kiln. and if i send it off, i need to decide whether i send it with the diamond inside it, or do i remove the diamond so it can be fired and then reset it when it comes back. because if i send it off then i’d quite like it to be tumbled too, so it looks all smooth and shiny. so that’s all being held up by my indecision. which is a pain in the bum. the second thing i wanted to do was to get a grip on my finances again, and see whether i could rearrange some of the credit card debts we have. i still haven’t touched this. it’s still on the list of Things To Do. the third thing was to spend a lot more time with my son. i’ve done this. i’ve definitely been more inclined to let things pass and let the housework slip so that when he asks if i’ll read him a book or sit and colour with him, i actually do instead of telling him i will ‘later’ or ‘in a minute’ or that ‘i’m busy’. hearing your child tell someone that mummy is always busy is heartbreaking. i hope he doesn’t think that way anymore. i need to make another list.